Here at Movable Ink, we invest in a world-class partnership program to help our clients make the most of their martech stacks and elevate their marketing experiences. And since customer loyalty remains one of the highest priorities for marketers, we’re proud to show off some work with our partners at CrowdTwist in this brand new case study. CrowdTwist enables marketers to collect a wealth of data on consumers through loyalty and engagement programs. Now it’s just a matter of making that data work for you while also delighting your customers….and that’s exactly where Movable Ink comes into play. We make it easy to wow customers with personalized data visualizations that connect your brand with your most loyal customers in the most relevant way. 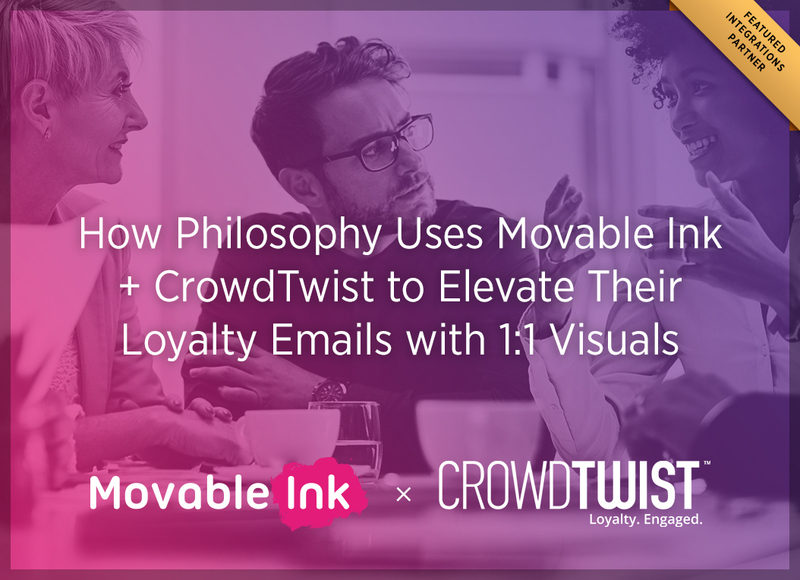 Together, Movable Ink + CrowdTwist make it easy for marketers to elevate their loyalty program through email campaigns with personalized data visualizations. By integrating real-time loyalty data in email, we can take your investment in loyalty even further by creating engaging digital experiences that encourage members to earn more points, move to the next rewards tier and ultimately forge a stronger connection with your brand. And the best part? You can check out how we teamed up to help Philosophy create data-driven intelligent creative for their loyalty emails. If you’re looking to learn more about what Movable Ink and CrowdTwist have to offer, check out our ebook full of proven strategies for elevating your rewards program with email. This entry was posted in Case Studies, Partners and tagged crowdtwist, intelligent creative, loyalty emails, loyalty marketing, loyalty marketing emails, partnerships, philosophy on January 30, 2019 by Carine Alexis.